Snakes evoke fear in humans as well as in a variety of other animals. In actuality, it is the snakes who should be, and often are, afraid. Snakes are hunted by a wide array of predators, and have developed a number of defenses to protect themselves. One of the most successful of these defensive tactics is the snake’s hiss. Snakes have an organ in the throat called the glottis, through which they breathe. When a snake breathes normally, the glottis opens and closes to control the flow of air. This is generally a quiet process, but can change at the snake’s discretion. By forcibly expelling air from the glottis, the snake makes structures within the glottis rattle, creating the iconic hissing sound. Some snakes are well equipped to defend themselves through venom or by sheer size, but most snakes are small and non-venomous. Hissing is an intimidating sound, and it helps to dissuade would-be predators. A hissing snake can give the impression of a larger, more dangerous adversary. Additional defensive tactics snakes may use include biting, expelling musk, and simply fleeing. In many circumstances, a snake will simultaneously use more than one defensive tactic to achieve the best results. Snakes don’t hiss to communicate with other snakes. They are not usually social creatures, and are only found together for breeding purposes, or in group hibernation. Snakes have little if any ability to hear airborne sounds. 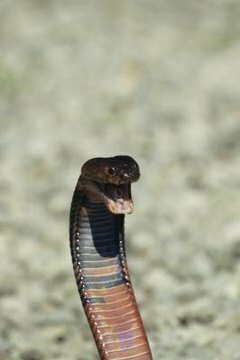 King cobras are known to emit very low-pitched growls of unknown purpose, but these are produced differently than hisses, and are carried via substrate transmission. While all snakes have the physiological capability to hiss, many species aren't known to hiss as a defensive mechanism. Very small snakes rarely hiss; as hissing is an intimidation technique, it is better suited to large snakes. Pine Snakes and their relatives are exceptional hissers, and have been found to have physiological adaptations to allow them to become some of the best hissing species in the world. Hognose snakes are also excellent hissers, and it should be noted that both species engage in several defensive behaviors, including striking and visual displays designed to exaggerate their body size.